Victory - Honor God. Make Disciples. | Real LIFE Scholars: Soaring to Greater Heights! You are here: Home / Real LIFE Scholars: Soaring to Greater Heights! On October 20-21, the Real LIFE Foundation will be holding its first National Convergence entitled, “Soar.” Around 250 scholars, LIFE coaches, and Real LIFE alumni will be taking part in this two-day event for refreshing and fellowship. The conference will capture various topics such as integrity, leadership, excellence, and faith. According to Vince Bitana, Real LIFE’s program coordinator, the theme was chosen to encourage every scholar to persevere and soar on wings like eagles, amidst their circumstances and backgrounds. We’re looking forward to the future that these young men and women will build! Let’s pray that from this seminar, these young men and women would rise up and take the challenge of overcoming all the obstacles they face and will face. Pray also that all of them would be examples to their families, friends, and classmates. Real LIFE Foundation provides high school and university scholarships to underprivileged but deserving students with good academic standing. They also offer feeding programs every Saturday morning to malnourished children in Pasig and Malate. If you would like to volunteer for Real LIFE’s feeding programs or know how you can help, you may call 817 1212 or visit their website. You can also follow their updates on Facebook and Twitter. I am part of the victory Metro east. May I ask how to get involved in scholarship? I am a 3rd year student in PLMar Marikina City. Thank you so much. 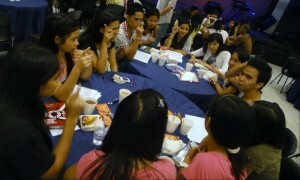 Victory Tagum and the Siopao Why Should I be Part of the Ten Days Experience?